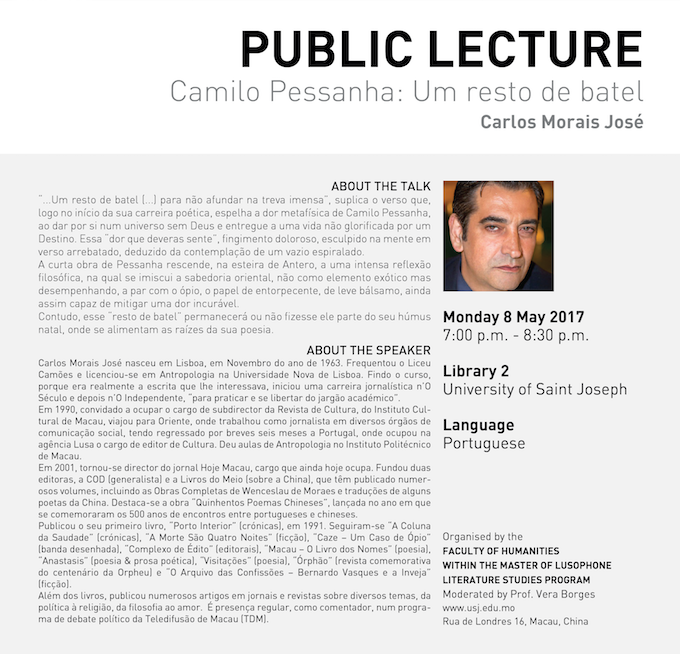 This lecture is about the poetry of Camilo Pessanha, his intensive philosophical reflection, in the wake of Antero de Quental. “…Um resto de batel (…) para não afundar na treva imensa: “the remains of a boat, so as not to sink into the immense darkness”, pleads the verse which, at the beginning of his poetic career, mirrors the metaphysical pain of Camilo Pessanha. The poet finds himself in a universe without God and submited to a life not glorified as a Destiny. Pessanha’s verses are imbued with oriental wisdom, not as an exotic element, but, along with opium, as a kind of narcotic, a sort of slight balm, yet able to mitigate an incurable metapshysical pain. Born in Lisbon, in 1963, Carlos Morais José holds a BA in Anthropology from the New University of Lisbon, Portugal, and has taught at the Macau Polytechnic Institute. In 1990 he came to Macau as deputy editor of the Revista de Cultura, do Instituto Cultural de Macau; he has been working as a journalist for several media since then. He is currently the director of Hoje Macau. He founded two publishers, COD and Livros do Meio, which has been publishing Wenceslau de Moraes and Chinese poets. As an author he has published chronicles (“Porto Interior”, “A Coluna da Saudade”), poetry (“Macau – O Livro dos Nomes”, “Anastasis”, “Visitações”) and fiction (“A Morte São Quatro Noites”, “O Arquivo das Confissões – Bernardo Vasques e a Inveja”). He has also prepared an edition of Pessanha’s Poetry (with Rui Cascais).